With so many great things to see and do, it's no wonder that Chattanooga, Tennessee has been recognized with numerous awards. Outside Magazine named Chattanooga the "Best Town Ever" in both 2011 and 2015, and Matador Network named Chattanooga one of the "20 coolest towns" in America in 2015. 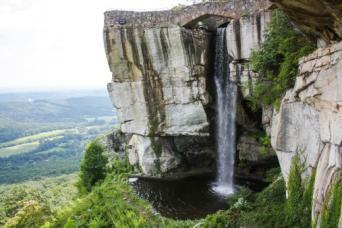 Plan a trip to this awesome destination to see firsthand just why Chattanooga is often described as the Scenic City! There is no shortage of awesome attractions in Chattanooga. No visit to Chattanooga is complete without a trip to Rock City. Situated atop Lookout Mountain, the destination is home to "massive ancient rock formations" and "gardens with over 400 native plant species." Youngsters (and the young at heart!) will delight in exploring the Enchanted Trail, Mother Goose Village and Fairyland Caverns. Perhaps the best feature is the unique panoramic view that allows you to look out and see seven states all at once. Ruby Falls is another must-see attraction although you'll need to be brave enough to ride an elevator to a depth of over 1,100 feet below the surface of the earth to partake in the magical beauty of this 145-foot underground waterfall, located in the heart of Lookout Mountain. If you can handle the elevator ride, the trip is more than worth the spectacular beauty that is Ruby Falls and the cave in which it is located. Special lantern-only tours are available seasonally. 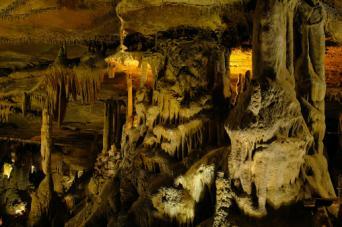 If you're a fan of cave tours, be sure to visit Raccoon Mountain Caverns when you're in Chattanooga. Unlike Ruby Falls, this tour doesn't require an elevator ride. Visitors of all fitness levels can enjoy a relatively easy 45-minute walking tour that encompasses about one-quarter of a mile of the cave's more than five-mile expanse. Those seeking a more adventurous experience can schedule a much more strenuous wild cave expedition that involves crawling, mud and the opportunity to see off-the-beaten-path areas of this lovely cave. Anita Covic, a North America Destination Specialist with TripTogether.com recommends The Hunter Museum of American Art as a must-see Chattanooga attraction for art lovers who visit the city. She states, "The museum showcases 100 years of architecture and houses the finest collection of American art in the Southeast. The museum's collection spans the history of American art from the colonial period to the present day, and covers a wide variety of media including painting, sculpture, contemporary studio glass and crafts." Don't let the name fool you - this is much more than a museum. 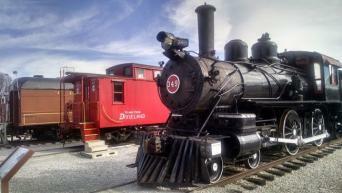 You'll be able to take a ride on a real vintage train when you visit the Tennessee Valley Railroad Museum. Departures for a few routes are available from the Chattanooga Depot. You can also travel a bit out of town to the Etowah Depot to take a different, and longer, route through the Tennessee countryside. If you're in town during Valentine's Day, New Year's Eve, Easter or Christmas, you may be able to enjoy a special seasonal train ride. For a less traditional train ride, set aside some time to ride Chattanooga's Incline Railway. This unique train travels straight up and down Lookout Mountain, along a steep grade of more than 72%. It's a fun ride from the base of the mountain to the top, during which you can enjoy the beautiful scenery from the class windows of the trolley-style rail car. There are unique attractions on both ends of the inclined track. At the bottom, you can enjoy unique shops and yummy food along with local services. At the top, there is an observation tower and attractions related to the area's Civil War history. 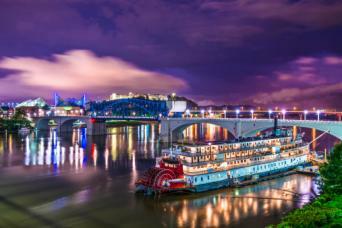 The Southern Belle Riverboat provides a wonderful opportunity to take in Chattanooga's beauty from the water with a sightseeing cruise on the Tennessee River. Lunch and dinner cruises are available as well as daytime sightseeing cruises that don't include a full meal. Cruises are narrated by knowledgeable guides, and the scenery will take your breath away. If you are lucky enough to visit in the fall, consider scheduling one of the seasonal leaf peeping cruises. Make your reservation well in advance, as the autumn cruises tend to sell out. The Tennessee Aquarium is recognized by numerous sources as being among the best aquariums in the United States, including Travel Channel, USA Today 10 Best, USCityTraveler.com and more. You'll have an opportunity to see examples of animals and habitats from throughout North America, including the local region and the Gulf of Mexico. Take in an IMAX 3D movie during your visit, or spend some time on the water onboard the facility's River Gorge Explorer vessel. Taking in the natural beauty of the great outdoors should be a key part of any trip to Chattanooga. 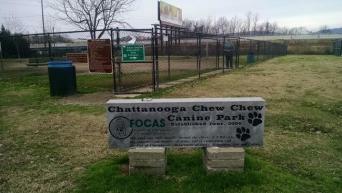 Chattanooga Chew Chew Canine Park: If you're traveling with a canine companion, your furry friend is sure to love an outing to the Chattanooga Chew Chew Canine Park. This off-leash park is on the edge of downtown and provides a great place for dogs of all sizes to run and play. There are separate fenced areas for large and small dogs, and the park is outfitted with agility equipment, fire hydrants and more. Big Daddy Loop on the Bluff Trail: If you're a fitness junkie, Covic recommends that you run or hike the Big Daddy Loop on the Bluff Trail. Consisting of seven trails on Lookout Mountain, she describes this scenic ten-mile loop as "a staple for Chattanooga trail running." It'll take between two and four hours to complete this trail, so it is most well-suited for those who are accustomed to long distance runs or hikes. Zip Stream Aerial Adventure: If you are a fan of zip lining, be sure to leave time in your schedule for this treetop tour of Lookout Mountain. There is also a climbing tower and you can opt for a route with or without rope course obstacles. This attraction is located at Ruby Falls, so you can make the most of your time by visiting both attractions on the same day. Chattanooga Skydiving Company: If you're looking for the ultimate outdoor adventure, consider scheduling time for a tandem or solo skydiving adventure. Chattanooga Skydiving Company has experienced instructors on staff, so check this out whether you're an experienced skydiver or a novice considering making your first jump. 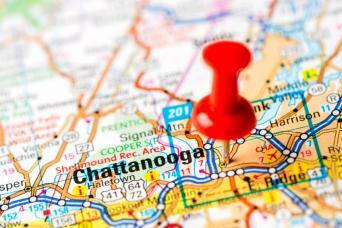 It's easy to travel to Chattanooga by car or plane from most points of departure. Car: Three major Interstates run through Chattanooga - I-24, I-59 and I-75. I-24 runs west to Nashville and beyond while I-59 connects Alabama, Mississippi and other points in the region. I-75 runs south to Chattanooga from Knoxville and continues to Atlanta down through Florida. Plane: Allegiant, American Eagle and Delta serve the Chattanooga Airport. Additionally, the Nashville and Knoxville airports are located within a two-hour drive from the city. Several ground transportation options are available from the airport, including taxis, limos and airport shuttles. Chattanooga isn't a difficult city in which to drive, so if you travel to the area by car, you won't have any difficulty getting around. Taxis and Uber are available as well as public transportation options. The Chattanooga Area Regional Transportation Authority (CARTA) operates city buses, with several routes throughout the city. CARTA service includes no-cost electric shuttles within the downtown area. Whether you prefer to stay in a hotel (historic or modern), bed and breakfast or campground, there are plenty of great choices in Chattanooga. If you're looking for a classic Chattanooga experience, stay downtown at the Chattanooga Choo Choo Hotel complex. For the ultimate in historic luxury, book a stay in one of the authentic Pullman train cars located on the grounds. For a more traditional experience, reserve a suite or room in one of the other hotel buildings that make up the complex. All accommodation options are luxurious and feature modern amenities. Dining and entertainment options are available in the complex. The Choo Choo isn't the only downtown hotel option - there are plenty of other great accommodations to consider. According to TripAdvisor, some of the best downtown hotels are Chattanooga Marriott Downtown, Hampton Inn & Suites Chattanooga/Downtown, Days Inn Rivergate and DoubleTree by Hilton Hotel Chattanooga Downtown. The north side of town, just off I-75 near Hamilton Place Mall, is also a great place to consider for your Chattanooga vacation home base. You'll enjoy the proximity to great shopping and dining, and it's easy to hop on the highway to head to whatever attractions are on your agenda. According to Hotels.com, great hotels to consider in this area include Courtyard Chattanooga I-75, Hampton Inn & Suites Chattanooga/Hamilton Place, Staybridge Suites Chattanooga at Hamilton Place and La Quinta Inn Chattanooga/Hamilton Place. Mayor's Mansion Inn: Not surprisingly, this 1899 inn was once home to a former mayor of Chattanooga. It is in the Fort Wood Historic district and is convenient to the city's major attractions. This property is the sole AAA Four-Diamond Historic Inn located in Chattanooga. Bluff View Inn: Accommodations are offered in three lovely historic homes in Chattanooga's Bluff View Art District in the downtown area with fabulous views of the Tennessee River. From here, you'll be able to walk to downtown dining, shopping and attractions, including the Tennessee Aquarium and the Southern Belle Riverboat. See BedandBreakfast.com for additional options in areas near the city. 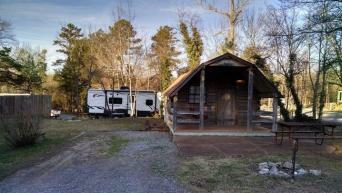 There are two KOA campgrounds in the Chattanooga area, both of which have tent sites, RV sites and cabins. They all offer Wi-Fi and cable television, as well as seasonal swimming pools. Chattanooga North/Cleveland KOA - This campground is just north of Chattanooga, in McDonald, TN. It is directly off Interstate 75. Lookout Mountain/Chattanooga West KOA - This campground is southwest of Chattanooga, just across the Georgia state line in Trenton. It is near Interstate 24 and Interstate 59. Additional area campgrounds are listed on the Good Sam website. Lupi's Pizza Pies: If you want to support local Chattanooga businesses and you're a fan of pizza, Covic recommends this establishment. She describes Lupi's as "a locally owned pizza parlor in downtown known for their mouthwatering and homemade pizzas." She exclaims, "Not only does their daily homemade sauce keep people coming back but the majority of their ingredients a locally grown as well, making the perfect recipe for a tantalizing pizza!" Sugar's Ribs: If you want to enjoy unspeakably good barbecue paired with an impressive view of Downtown Chattanooga, Sugar's Ribs is the best place to go. This restaurant's ribs have been described as "crunchy outside and fall-off-the-bone inside" with six different sauce flavors to suit any taste. 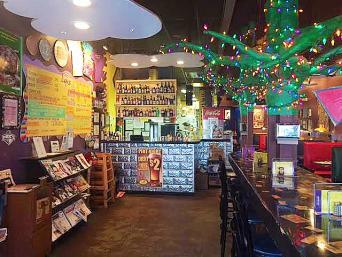 They also have barbecue plates, sandwiches, tacos and an impressive collection of sides. City Cafe Diner: If you're looking for a restaurant with a casual atmosphere, a huge menu selection and super-sized portions, look no further than City Cafe Diner. This isn't your typical greasy spoon. They have an impressive menu, with everything from traditional diner fare (sandwiches and plate dinners) to luscious seafood, Mexican dishes, Greek specialties and an unbelievable selection of desserts. There are two locations in Chattanooga (downtown and Lee Highway). 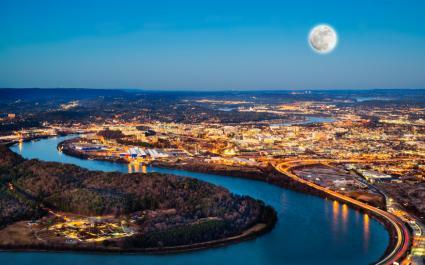 With so much to see and do, you're sure to have a wonderful time in Chattanooga. You might not even have time to take it all in on a single visit! Either plan an extended stay or make plans to return; just once is never enough!